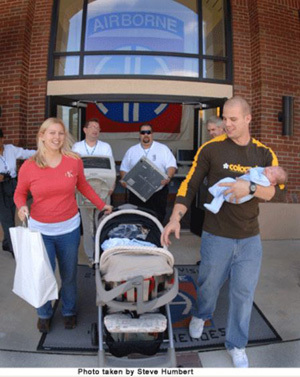 Since delivering the first computer on Mother’s Day, 2002, the generous donors, technology partners and numerous volunteers of Operation Homelink have all shared a passion to support our men and women who have bravely served our nation by distributing over 7,500 refurbished computers to wounded warriors, student vets and the families of servicemembers deployed overseas. With the common proliferation of laptops, mobile devices and smartphones, today’s military families are more readily able to communicate than when we started this mission almost 15 years ago. Having accomplished much of its desired mission, today our all-volunteer organization is announcing the discontinuation of our work of refurbishing and distributing computers to military families, wounded warriors and student veterans. While we very much appreciate the opportunity to respectfully assist military families, we will always understand that our efforts were only a small token of appreciation for the many sacrifices made not only by those serving on the front lines…but also by the spouses, parents and children who proudly serve on the homefront. While we end this chapter in the history of Operation Homleink, we look forward to the opportunity to commence a new initiative to foster and expand veteran employment opportunities in the months and years ahead. More info to follow on this website. We would like to extend a special thank you to Alvin Katz (at the time with Mayer, Brown and Platt), Marc Kadish and others at MBP for graciously providing the substantial pro bono legal services that made our work possible. Finally and most importantly, on behalf of all those who made Operation Homelink a reality, thanks to all the men and women who earned our support and respect the minute they signed up to protect our country from perils near and far. To every one of you that strapped on your boots to do the heavy lifting for 99% percent of Americans you served, those whom we can never repay the debt that you are owed...we say “Thank you”. Operation Homelink and Levi Strauss & Co. 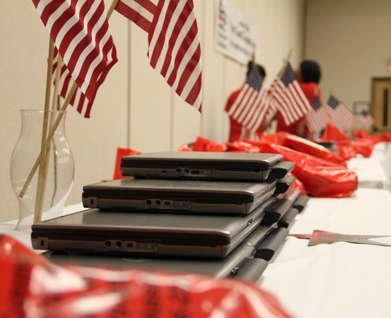 Team up to Provide Laptops to Student Vets and Veteran Organizations Across the U.S.
Chicago, IL– August 30th, 2015 – Operation Homelink in collaboration with Levi Strauss & Co. are helping Operation Iraqi Freedom and Operation Enduring Freedom veterans by supplying refurbished laptops to help student vets succeed in colleges and universities across the US. While many service members have taken advantage of Post-911 education benefits, some don’t have the financial resources to own their own laptop and are limited to using school computers only during school hours. Also while many colleges have recently opened Veteran Resource Centers, some school budgets don’t allow outfitting the centers with computers. This joint initiative solves these problems by outfitting their Veteran Resource Centers while also permitting schools to loan laptops directly student vets during the school year. Utilizing their own laptop enables vets to take classes on-line, email teachers, do homework and resource work from the comfort of their home and at wireless-enabled retail locations. “These valuable technology resources will assist our veterans in their efforts to achieve academic success” said Peter LaHaie, Veteran Services Coordinator, Roosevelt University in Chicago that received 15 computers. “I would like to express our sincere gratitude to your organization and Levi Strauss & Company for all you do for our nation’s heroes and their families”. Over 300 computers were donated by San Francisco-based Levi Strauss & Company to jumpstart this program to give back to the thousands of young vets who are returning to school, many who served in Iraq or Afghanistan. Levi Strauss computers have been provided to numerous colleges and universities including Long Island University, Brooklyn, NY, Johnson County Community College, Overland Park, KS; Lewis University, Romeoville, IL: University of Illinois-Chicago and North Texas Community College, Dallas, TX. Levi’s also supplied additional laptops to non-profit veteran support organizations including the Wounded Warrior Project, Valor Clinic Foundation in Pennsylvania, Army Community Service at Fort Hamilton in Brooklyn, NY and several Veteran Resource Centers in Dallas, TX. We are extremely appreciative of Levi Strauss & Co. stepping up to support these student vets and vet organizations we are honored to serve.” said Dan Shannon, Founder and President of Operation Homelink. Fort Campbell, KY - January 26, 2013 - One hundred smiles, one hundred handshakes, one hundred thank you's; one hundred members of the 101st Airborne Division (Air Assault), received free refurbished laptops and webcams during Operation Homelink at Fort Campbell's Family Resource Center, Jan. 26. Fluor, Inc. of Irving, Tx., the number one Fortune 500 Company for engineering and construction, made the Operation Homelink donations possible. The Screaming Eagle family members were excited to receive their new electronic devices. Alexandra Lugrain, carrying 2-month old Abel, and husband Anthony Lugrain leave the Family Resource Center at Fort Campbell, KY on January 26th, 2013 with one of 101 refurbished laptops and new webcams given to Fort Campbell families. Anthony, a specialist with the 52nd EOD Group of the 101st Airborne Division will deploy to Afghanistan in May, 2013. "I am ecstatic about having this laptop and was very surprised when I first heard of this opportunity," said Cassie Coley, wife of Spc. Arthur Coley, a cargo specialist with the division's 101st Sustainment Brigade and she is also the mother of eight-month-old Brianna Coley. "I think this is a great thing done for my family by these really thoughtful people." Operation Homelink is an all-volunteer, non-profit organization founded in the fall of 2002. Their mission is to facilitate e-mail messaging, social networking and video communication between servicemembers deployed overseas to their families back home. The group does not look at the laptops as a free gift, but as something already the Soldiers and family members have earned. Chicago-based non-profit Operation Homelink distributed 101 computers to families of the 101st Airborne with a family member soon to deploy to Afghanistan. The computers were donated by the Fluor Corporation of Irving, Texas and the webcams by Cisco of San Jose, CA. . To date, Operation Homelink has donated over 7,100 computers to military families, wounded warriors and unemployed veterans all across the US over the last ten years. "We appreciate the sacrifices made by today's Soldier and their spouses and they deserve our respect," said Dan Shannon, president and founder of Operation Homelink. "These laptops that are being providing today were earned a long time ago when that Soldier strapped on their boots, stood up and said, 'send me.' They are earned every early morning when that spouse gets up and gets those kids off to school; this is a small token to show them our appreciation." Eligible for the gifts are Soldiers and their family members ranging from the pay grades of E1 to E5, private to sergeant. During this particular Operation Homelink drop-off, the receiving families were given the tools to stay in contact with their deploying heroes with a refurbished Dell laptop and web cam. Bridgette Taylor carrying four-month-old son Aiden, is helped out with the laptop and webcam she received at the Family Resource Center at Fort Campbell, KY on January 26, 2013 from Operation Homelink. "It's not everyday you find people that are kind enough to do something like this and a Soldier's pay isn't the highest around, don't get me wrong, I don't serve for the money, but my family actually did need a laptop," said Spc. Coley. "It is difficult to stay in touch with family while overseas and this helps staying in contact with my wife during deployments." The 101st Airborne Division currently has units deployed to Afghanistan with more about to go as its headquarters unit began their deployment process with a casing of the colors ceremony held Jan. 25. 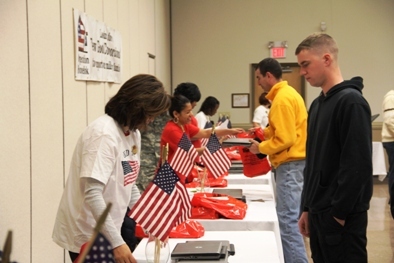 Operation Homelink, whose supporters now include companies like Fluor, Raytheon, Dell and Southwest Airlines, has distributed 7,100 computers to military families, wounded warriors and unemployed veterans since its founding. Family Readiness volunteers distributed refurbished laptops and new webcams to 101 military families stationed at Fort Campbell, KY on January 26, 2013. The computers, distributed by non-profit Operation Homelink, were donated by Fluor of Irving, TX. "I am humbled and have such an appreciation for anyone that wears the uniform and their family members and their stories," said Shannon. "Today a young woman, with tears in her eyes, told me about her four-month-old son named Aiden and how she wanted him to remember his deployed father's voice and face, so that Aiden would then recognize his father when he returns home. Hearing the story about Aiden makes everything we've done all worth it; we are blessed and fortunate to serve those who serve." Operation Homelink's goal to support the members of the armed forces by bridging the gap of time and distance while separated, is considered an honor on their behalf.